The 2019 season will be a historic year as a brand new 100% electric category will be introduced to the MotoGP™ paddock: the FIM Enel MotoE™ World Cup. The inaugural grid – apart from Xavier Simeon (Avinita Esponsorama Racing) and Hector Garzo (Tech 3 E-Racing) - congregated together for the first time in Jerez at the end of November as the riders got to grips with the Energica Ego Corsa machines, alongside the Triumph-powered Moto2™ grid. 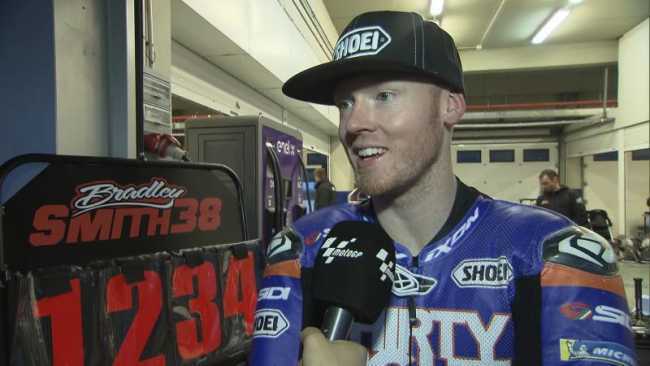 The pacesetter after the first three days of testing was One Energy Racing’s Bradley Smith, as the British rider competes in the 2019 MotoE™ Championship alongside his new testing role with Aprilia Racing Team Gresini. Smith finished over three tenths clear of second fastest Niki Tuuli (Ajo Motorsport MotoE) with the Finn, in turn, finishing ahead of 2008 125 World Champion Mike Di Meglio (EG 0,0 Marc VDS). Elsewhere, fellow 125 Champion Nico Terol (Angel Nieto Team) ended the test in P17 on the combined times, with teammate Maria Herrera just behind him – the latter becoming the first women to compete in the FIM Enel MotoE™ World Cup. Sete Gibernau’s (Pons Racing) eagerly anticipated return to racing action ended with the Spaniard 14th on the combined timesheets, one place behind former WorldSBK rider Lorenzo Savadori (Trentino Gresini MotoE). In addition, former MotoGP™ riders Randy De Puniet (LCR E-Team) and Alex de Angelis (Alma Pramac Racing) were 8th and 11th on the timesheets respectively – four likely contenders for race wins in 2019. Luca Vitali (Ongetta SIC58 Squadra Corse) crashed on the opening day in Jerez at Turn 7, sustaining a broken collarbone and additional injuries to his left hand. The electric machines will take to the Circuito de Jerez – Angel Nieto again on 13th, 14th and 15th March to complete three more days of testing, with the first MotoE™ race being held at the Andalusian circuit on 5th May. Current time: 22-04-2019, 10:13 AM Powered By MyBB, © 2002-2019 MyBB Group.